For other uses, see Fujian (disambiguation). "Hokkian" redirects here. For Hokkien dialect speaking in the South Fujian, see Hokkien. 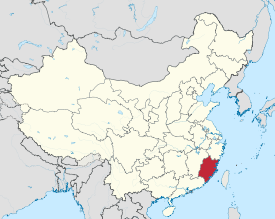 Fujian ( 福建; formerly romanized as Fukien) is a province on the southeast coast of mainland China. Fujian is bordered by Zhejiang to the north, Jiangxi to the west, Guangdong to the south, and the Taiwan Strait to the east. The name Fujian came from the combination of Fuzhou and Jianzhou (present Nanping), two cities in Fujian, during the Tang dynasty. While its population is chiefly of Han origin, it is one of the most culturally and linguistically diverse provinces in China. As a result of the Chinese Civil War, Historical Fujian is now divided between the People's Republic of China (PRC) and the Republic of China (ROC) based in Taiwan, and both territories are named the Fujian province in their respective administration divisions. The majority of the territory of historical Fujian (the mainland territory and a few islands) currently make up the Fujian province of the PRC. The Fujian province of the ROC is made up of the Matsu Islands, the Wuqiu Islands and the Kinmen Islands, the two latter archipelagos constituting Kinmen County. Recent[when?] archaeological discoveries demonstrate that Fujian had entered the Neolithic Age by the middle of the 6th millennium BC. From the Keqiutou site (7450–5590 BP), an early Neolithic site in Pingtan Island located about 70 kilometres (43 mi) southeast of Fuzhou, numerous tools made of stones, shells, bones, jades, and ceramics (including wheel-made ceramics) have been unearthed, together with spinning wheels, which is definitive evidence of weaving. The Tanshishan (曇石山) site (5500–4000 BP) in suburban Fuzhou spans the Neolithic and Chalcolithic Age where semi-underground circular buildings were found in the lower level. 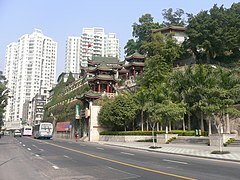 The Huangtulun (黃土崙) site (ca.1325 BC), also in suburban Fuzhou, was of the Bronze Age in character. Tianlong Jiao (2013) notes that the Neolithic appeared on the coast of Fujian around 6,000 B.P. During the Neolithic, the coast of Fujian had a low population density, with the population depending on mostly on fishing and hunting, alongside with limited agriculture. There were four major Neolithic cultures in coastal Fujian, with the earliest Neolithic cultures originating from the north in coastal Zhejiang. There were two major Neolithic cultures in inland Fujian, which were highly distinct from the coastal Fujian Neolithic cultures. Fujian was also where the kingdom of Minyue was located. The word "Mǐnyuè" was derived by combining "Mǐn" (simplified Chinese: 闽; traditional Chinese: 閩; Pe̍h-ōe-jī: bân), which is perhaps an ethnic name (simplified Chinese: 蛮; traditional Chinese: 蠻; pinyin: mán; Pe̍h-ōe-jī: bân), and "Yuè", after the State of Yue, a Spring and Autumn period kingdom in Zhejiang to the north. This is because the royal family of Yuè fled to Fujian after its kingdom was annexed by the State of Chu in 306 BC. Mǐn is also the name of the main river in this area, but the ethnonym is probably older. Minyue was a de facto kingdom until one of the emperors of the Qin dynasty, the first unified imperial Chinese state, abolished its status. In the aftermath of the Qin dynasty's fall, civil war broke out between two warlords, Xiang Yu and Liu Bang. The Minyue king Wuzhu sent his troops to fight with Liu and his gamble paid off. Liu was victorious and founded the Han dynasty. In 202 BC, he restored Minyue's status as a tributary independent kingdom. Thus Wuzhu was allowed to construct his fortified city in Fuzhou as well as a few locations in the Wuyi Mountains, which have been excavated in recent years. His kingdom extended beyond the borders of contemporary Fujian into eastern Guangdong, eastern Jiangxi, and southern Zhejiang. After Wuzhu's death, Minyue maintained its militant tradition and launched several expeditions against its neighboring kingdoms in Guangdong, Jiangxi, and Zhejiang, primarily in the 2nd century BC. This was stopped by the Han dynasty as it expanded southward. The Han emperor eventually decided to get rid of the potential threat by launching a military campaign against Minyue. Large forces approached Minyue simultaneously from four directions via land and sea in 111 BC. The rulers in Fuzhou surrendered to avoid a futile fight and destruction and the first kingdom in Fujian history came to an abrupt end. The Han dynasty collapsed at the end of the 2nd century AD, paving the way for the Three Kingdoms era. Sun Quan, the founder of the Kingdom of Wu, spent nearly 20 years subduing the Shan Yue people, the branch of the Yue living in mountains. Nevertheless, isolation from nearby areas owing to rugged terrain contributed to Fujian's relatively undeveloped economy and level of development, despite major population boosts from northern China during the "barbarian" invasions. Population density in Fujian remained low compared to the rest of China. Only two commanderies and sixteen counties were established by the Western Jin dynasty. Like other southern provinces such as Guangdong, Guangxi, Guizhou, and Yunnan, Fujian often served as a destination for exiled prisoners and dissidents at that time. During the Sui and Tang eras a large influx of migrants settled in Fujian. The Tang dynasty (618–907) oversaw the next golden age of China, which contributed to a boom in Fujian’s culture and economy. Fuzhou's economic and cultural institutions grew and developed. The later years of the Tang dynasty saw a number of political upheavals in the Chinese heartland, prompting another wave of Chinese to immigrate to Fujian. As the Tang dynasty ended, China was torn apart in the period of the Five Dynasties and Ten Kingdoms. During this time, a second major wave of immigration arrived in the safe haven of Fujian, led by General Wang, who set up an independent Kingdom of Min with its capital in Fuzhou. After the death of the founding king, however, the kingdom suffered from internal strife, and was soon absorbed by Southern Tang, another southern kingdom. 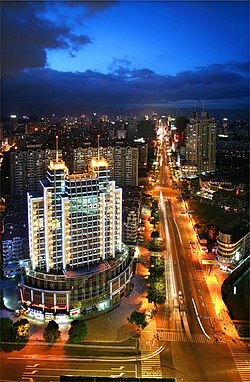 Quanzhou city was blooming into a seaport under the reign of the Min Kingdom and was the largest seaport in the world.[when?] For a long period of time its population was also greater than Fuzhou. Due to the Ispah Rebellion, Quanzhou city lost foreign interest of trading and it's formerly welcoming international image as the foreigners were all massacred or deported. The Lý dynasty monarchs of Vietnam were of Chinese ethnicity. Jinjiang district of Quanzhou prefecture was the origin of Lý Thái Tổ 李公蘊, the ancestor of the Lý dynasty ruling family. 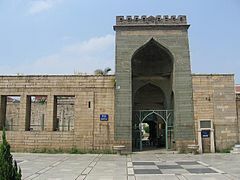 [a] China, Fujian was the home of Lý Công Uẩn. The ethnic Chinese background of Lý Công Uẩn has been accepted by Vietnamese historian Trần Quốc Vượng. The founder of the Trần Dynasty in Vietnam, Emperor Trần Thái Tông, was the great-grandson of a Chinese person who came to Vietnam from Fujian from the Chinese Chen clan. Several members of the family, like the prince Trần Quốc Tuấn, continued to know how to speak Chinese. The name of the prince’s great grandfather was Trần Kinh. People from the Song dynasty of China, like Zhao Zhong and Xu Zongdao, fled to the Trân dynasty after the Mongol invasion of China. The Daoist cleric Xu Zongdaowho, who recorded the Mongol invasion and called them "Northern bandits", also came from Fujian. 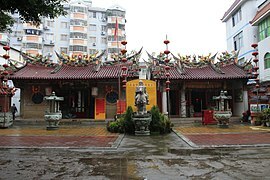 Fujian or Guangxi was the origin of the ethnic Chinese Tran who migrated to Vietnam along with a large number of other Chinese, during the Vietnamese Ly dynasty, where they served as officials. Distinctly Chinese last names are found in the Tran and Ly dynasty Imperial exam records. Ethnic Chinese are recorded in Tran and Ly dynasty records of officials. Clothing, food, and language were all Chinese dominated in Van Don where the Tran had moved after leaving their home province of Fujian. The Chinese language could still be spoken by the Tran in Vietnam. The side of Vietnam that borders the ocean was colonized by Chinese migrants from Fujian. This included the Tran among them who settled in the capital's southeastern area. The Red River Delta was subjected to migration of people from different provinces all over China through Fujian's major city port. The Tran and Van Don port arose as a result of this interaction. Fujian and Guangdong Chinese moved to the Van Don coastal port during Ly Anh Tong's rule to engage in commerce. The usurpation of the Ly occurred after they married with the fishing Fujianese Tran family. In 1172 Fujian was attacked by Pi-she-ye pirates from Taiwan. In the early Ming dynasty, Quanzhou was the staging area and supply depot of Zheng He's naval expeditions. Further development was severely hampered by the sea trade ban, and the area was superseded by nearby ports of Guangzhou, Hangzhou, Ningbo and Shanghai despite the lifting of the ban in 1550. Large-scale piracy by Wokou was eventually wiped out by Chinese military and Japanese authority of Toyotomi Hideyoshi. An account of Ming dynasty Fujian was written by No In 鲁认. The Pisheya appear in Quanzhou Ming era records. The late Ming and early Qing dynasty symbolized an era of large influx of refugees and another 20 years of sea trade ban under the Kangxi Emperor, a measure intended to counter the refuge Ming government of Koxinga in the island of Taiwan. The seaban implented by the Qing forced many people to evacuate the coast in order to deprive Koxinga's Ming loyalists of resources. This has led to the myth that it was because Manchus were "afraid of water". Incoming refugees did not translate into a major labor force, owing to their re-migration into prosperous regions of Guangdong. In 1683, the Qing dynasty conquered Taiwan and annexed it into the Fujian province, as Taiwan Prefecture. Settlement of Taiwan by Han Chinese followed. Today, most Taiwanese are descendants of Hokkien people from Southern Fujian. Fujian arrived at its present extent after Taiwan was developed into an independent province (Fujian-Taiwan-Province) starting in 1885. Just ten years later, the Qing ceded Taiwan to Japan via the Treaty of Shimonoseki after losing the First Sino-Japanese War. The Xinhai revolution overthrew the Qing dynasty brought the province into the rule of the Republic of China. Fujian briefly gained independence from China again under the Fujian People's Government until it was recontrolled by Republic of China. It came under Japanese sea blockade during World War II. Fujian's slow development in its early days has proved a blessing for the province's ecology; today, the province has the highest forest coverage rate and the most diverse biosphere in China whereas central China suffers from severe overpopulation and displays severe signs of soil erosion, with frequent droughts and floods due to lack of forest coverage. 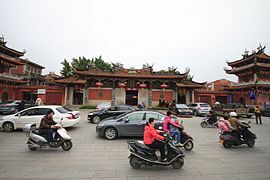 Development has been accompanied by a large influx of population from the overpopulated areas in the north and west, and much of the farmland and forest as well as cultural heritage sites such as the temples of king Wuzhu have given way to ubiquitous high-rise buildings. The government faces challenges at all levels to sustain development while at the same time preserving Fujian's unique and vital natural and cultural heritage. The province is mostly mountainous, and is traditionally said to be "Eight parts mountain, one part water, and one part farmland" (八山一水一分田). The northwest is higher in altitude, with the Wuyi Mountains forming the border between Fujian and Jiangxi. It is the most forested provincial level administrative region in China, with a 62.96% forest coverage rate in 2009. Fujian's highest point is Mount Huanggang in the Wuyi Mountains, with an altitude of 2,157 metres (1.340 mi). Fujian faces East China Sea to the east, South China Sea to the south, and the Taiwan Strait to the southeast. The coastline is rugged and has many bays and islands. Major islands include Quemoy (also known as Kinmen) (controlled by the Republic of China), Haitan Island, and Nanri Island. Meizhou Island occupies a central place in the cult of the goddess Matsu, the patron deity of Chinese sailors. The Min River and its tributaries cut through much of northern and central Fujian. Other rivers include the Jin and the Jiulong. 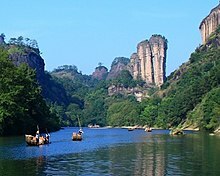 Due to its uneven topography, Fujian has many cliffs and rapids. Fujian is separated from Taiwan by the 180 kilometres (110 mi)-wide Taiwan Strait. Some of the small islands in the Taiwan Strait are also part of the province. The islands of Quemoy and Matsu are under the administration of the Republic of China. Fujian contains several faults, the result of collision between the Asiatic Plate and the Philippine Sea Plate. The Changle-Naoao and Longan-Jinjiang fault zones in this area have annual displacement rates of 3–5 mm. They could cause major earthquakes in the future. Fujian has a subtropical climate, with mild winters. In January, the coastal regions average around 7–10 °C (45–50 °F) while the hills average 6–8 °C (43–46 °F). In the summer, temperatures are high, and the province is threatened by typhoons coming in from the Pacific. Average annual precipitation is 1,400–2,000 millimetres (55–79 in). As of 2012[update], there are 54,876 kilometres (34,098 miles) of highways in Fujian, including 3,500 kilometres (2,200 miles) of expressways. The top infrastructure projects in recent years have been the Zhangzhou-Zhaoan Expressway (US$624 million) and the Sanmingshi-Fuzhou expressway (US$1.40 billion). The 12th Five-Year Plan, covering the period from 2011 to 2015, aims to double the length of the province's expressways to 5,500 kilometres (3,400 mi). 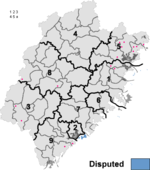 Within Fujian, coastal and interior cities are linked by the Nanping–Fuzhou (1959), Zhangping–Quanzhou–Xiaocuo (2007) and Longyan–Xiamen Railways, (2012). To attract Taiwanese investment, the province intends to increase its rail length by 50 percent to 2,500 km (1,553 mi). The major airports are Fuzhou Changle International Airport, Xiamen Gaoqi International Airport, Quanzhou Jinjiang International Airport, Nanping Wuyishan Airport, Longyan Guanzhishan Airport and Sanming Shaxian Airport. Xiamen is capable of handling 15.75 million passengers as of 2011. Fuzhou is capable of handling 6.5 million passengers annually with a cargo capacity of more than 200,000 tons. The airport offers direct links to 45 destinations including international routes to Japan, Malaysia, Thailand, Singapore, and Hong Kong. All of the prefecture-level cities except Nanping, Sanming, and Longyan are found along the coast. The nine prefecture-level divisions are subdivided into 85 county-level divisions (28 districts, 13 county-level cities, and 44 counties). Those are in turn divided into 1,107 township-level divisions (605 towns, 328 townships, 18 ethnic townships, and 156 subdistricts). The People's Republic of China claims the Republic of China-controlled Kinmen Islands as a Jinmen County of the prefecture-level city of Quanzhou. The ROC administers them as five of the six townships of its Kinmen County. The PRC claims the ROC-controlled Wuqiu Islands as part of Xiuyu District of the prefecture-level city of Putian. The ROC administers them as Wuqiu Township of Kinmen County. Finally, the PRC claims the ROC-controlled Matsu Islands as a Mazu Township of its Lianjiang County, which is part of the prefecture-level city of Fuzhou. The ROC administers the Matsu Islands as four townships making up its Lienchiang County (which is the same name but romanized differently). Together, these three groups of islands make up the Republic of China's Fujian Province. ^ a b New district established after census: Changle (Changle CLC). The new district not included in the urban area & district area count of the pre-expanded city. ^ Does not include Beigan Township, Dongyin Township, Juguang Township, & Nangan Township (controlled by ROC) in the city proper count. ^ Does not include Jinmen County (controlled by ROC) in the city proper count. ^ a b New district established after census: Yongding (Yongding County). The new district not included in the urban area & district area count of the pre-expanded city. ^ a b New district established after census: Jianyang (Jianyang CLC). The new district not included in the urban area & district area count of the pre-expanded city. In 2011, Fujian's nominal GDP was 1.74 trillion yuan (US$276.3 billion), a rise of 13 percent from the previous year. Its GDP per capita was 46,802 yuan (US$7,246 (9th)). By 2015 Fujian expects to have at least 50 enterprises that have over 10 billion RMB in annual revenues. The government also expects 55 percent of GDP growth to come from the industrial sector. Mud clams, oysters and shrimp are raised in Anhai Bay off Shuitou. Han Chinese make up 98% of the population. Various Fujianese peoples (Min-speaking groups) make up the largest subgroups of Han Chinese in Fujian. This includes the Hoklo people, Fuzhounese people, Teochew people and Putian people. Hakka, a Han Chinese people with its own distinct identity, live in the southwestern parts of the province bordering Guangdong. Hui'an, also a Han branch with their distinct culture and fashion, populate Fujian's southeast coastline near Chongwu in Hui'an County. The She, scattered over mountainous regions in the north, is the largest minority ethnic group of the province. Many ethnic Chinese around the world, especially in Southeast Asia, trace their ancestries to the Fujianese branches of Hoklo people and Teochew people. Descendants of Southern Min speaking emigrants make up the predominant majority ethnic Chinese populations of Taiwan, Singapore, Malaysia, Indonesia and Philippines. While Eastern Min speaking people, especially Fuzhounese people, is one of the major sources of China immigrants in the United States, especially since the 1990s. (The seventh subdivision of Min, Qiong Wen, is not spoken in Fujian.) Hakka, another subdivision of spoken Chinese, is spoken around Longyan by the Hakka people who live there. As is true of other provinces, the official language in Fujian is Mandarin, which is used for communication between people of different localities, although native Fujian peoples still converse in their native languages and dialects respectively. Fujian cuisine, with an emphasis on seafood, is one of the eight great traditions of Chinese cuisine. It is composed of traditions from various regions, including Fuzhou cuisine and Min Nan cuisine. The most prestigious dish is Fotiaoqiang (literally "Buddha jumps over the wall"), a complex dish making use of many ingredients, including shark fin, sea cucumber, abalone and Shaoxing wine (a type of Chinese alcoholic beverage). Zhan Shi Chai (1840s–1893), entertainer as "Chang the Chinese giant"
Tsai Chi-Kun (1912–2004), "father of the Taiwan Symphony"
^ The data was collected by the Chinese General Social Survey (CGSS) of 2009 and by the Chinese Spiritual Life Survey of 2007, reported and assembled by Xiuhua Wang (2015) in order to confront the proportion of people identifying with two similar social structures: ① Christian churches, and ② the traditional Chinese religion of the lineage (i. e. people believing and worshipping ancestral deities often organised into lineage "churches" and ancestral shrines). Data for other religions with a significant presence in China (deity cults, Buddhism, Taoism, folk religious sects, Islam, et al.) was not reported by Wang. ^ "Doing Business in China - Survey". Ministry Of Commerce - People's Republic Of China. Archived from the original on August 5, 2013. Retrieved 5 August 2013. ^ "Communiqué of the National Bureau of Statistics of People's Republic of China on Major Figures of the 2010 Population Census  (No. 2)". National Bureau of Statistics of China. April 29, 2011. Archived from the original on July 27, 2013. Retrieved 4 August 2013. ^ 福建省2017年国民经济和社会发展统计公报 [Statistical Communiqué of Fujian on the 2017 National Economic and Social Development] (in Chinese). Fujian Bureau of Statistics. February 22, 2018. Retrieved June 22, 2018. ^ "China National Human Development Report 2016" (PDF). United Nations Development Programme. p. 146. Retrieved December 5, 2017. ^ a b c Jiao, Tianlong. 2013. "The Neolithic Archaeology of Southeast China." In Underhill, Anne P., et al. A Companion to Chinese Archaeology, 599-611. Wiley-Blackwell. ^ The Pan-Pearl River Delta: An Emerging Regional Economy in a Globalizing China. p. 41. ^ 中国网事:千年古港福建"泉州港"被整合改名引网民争议. Xinhua News. Retrieved August 17, 2014. ^ "The Stranger Kings of the Lý and Trần Dynasties – Le Minh Khai's SEAsian History Blog". Leminhkhai.wordpress.com. September 7, 2013. Retrieved June 27, 2018. ^ 千年前泉州人李公蕴越南当皇帝 越南史上重要人物之一. fjsen.com. October 12, 2010. ^ 两安海人曾是安南皇帝 有关专家考证李公蕴、陈日煚籍属晋江安海. qzwb.com. December 28, 2008. ^ a b K. W. Taylor (May 9, 2013). A History of the Vietnamese. Cambridge University Press. pp. 120–. ISBN 978-0-521-87586-8. ^ a b Kenneth R. Hall (2008). Secondary Cities and Urban Networking in the Indian Ocean Realm, C. 1400-1800. Lexington Books. pp. 159–. ISBN 978-0-7391-2835-0. ^ "Giặc Bắc đến xâm lược! : Translations and Exclamation Points – Le Minh Khai's SEAsian History Blog". Leminhkhai.wordpress.com. December 4, 2015. Retrieved June 27, 2018. ^ Alexander Woodside (1971). Vietnam and the Chinese Model: A Comparative Study of Vietnamese and Chinese Government in the First Half of the Nineteenth Century. Harvard Univ Asia Center. pp. 8–. ISBN 978-0-674-93721-5. ^ Geoffrey C. Gunn (August 1, 2011). History Without Borders: The Making of an Asian World Region, 1000-1800. Hong Kong University Press. pp. 112–. ISBN 978-988-8083-34-3. ^ Hall (January 1, 1955). Secondary Cities & Urban Networking in the Indian Ocean Realm, c. 1400-1800. Lexington Books. pp. 159–. ISBN 978-0-7391-3043-8. ^ Jayne Werner; John K. Whitmore; George Dutton (August 21, 2012). Sources of Vietnamese Tradition. Columbia University Press. pp. 29–. ISBN 978-0-231-51110-0. ^ Philippe Truong (2007). The Elephant and the Lotus: Vietnamese Ceramics in the Museum of Fine Arts, Boston. MFA Pub. p. 18. ISBN 978-0-87846-717-4. ^ Ainslie Thomas Embree; Robin Jeanne Lewis (1988). Encyclopedia of Asian history. Scribner. p. 190. ^ Skinner, George William; Baker, Hugh D. R. (1977). The City in late imperial China. Stanford University Press. p. 197. ISBN 978-0-8047-0892-0. ^ "Forestry in Fujian Province" (in Chinese). English.forestry.gov.cn. January 21, 2010. Retrieved May 7, 2012. ^ Guo, Jianming; Xu, Shiyang; Fan, Hailong (May 5, 2017). "Neotectonic interpretations and PS-InSAR monitoring of crustal deformations in the Fujian area of China". Open Geosciences. 9 (1): 126–132. doi:10.1515/geo-2017-0010. ISSN 2391-5447. ^ "China Briefing Business Reports". Asia Briefing. 2012. Archived from the original on September 4, 2012. Retrieved February 8, 2009. ^ Shenzhen Statistical Bureau. 《深圳统计年鉴2014》 (in Chinese). China Statistics Print. Retrieved May 29, 2015. ^ "Ever cuddlier". The Economist. December 18, 2008. ^ 福建省2009年国民经济和社会发展统计公报_中国统计信息网. Tjcn.org. March 2, 2010. Retrieved May 7, 2012. ^ Semple, Kirk (October 21, 2009). "In Chinatown, Sound of the Future Is Mandarin". New York Times. Retrieved July 9, 2014. ^ Kurpaska, Maria (2010). Chinese Language(s): A Look Through the Prism of "The Great Dictionary of Modern Chinese Dialects". Walter de Gruyter. pp. 49, 52, 71. ISBN 978-3-11-021914-2. ^ Norman, Jerry (1988). Chinese. Cambridge: Cambridge University Press. p. 233. ISBN 978-0-521-29653-3.